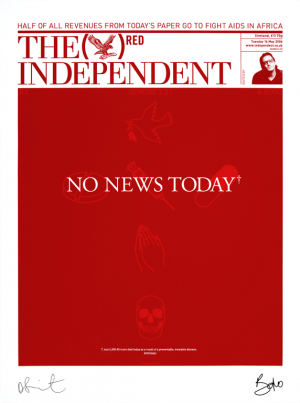 Produced on the occasion of World Aids Day, 1st December 2007, this print is a replica of the front page of The Independent newspaper from 16th May 2006, as designed by Damien Hirst while Bono was guest editor for the landmark (RED) edition. A striking image proclaiming there was "No News Today" however the small print reads "Just 6,500 African's died today as a result of a preventable, treatable disease." All profits from the sale of these prints goes directly to the Global fund (recipient of RED funds) that finances programs to fight AIDS, tuberculosis and malaria in Africa. The print is signed on the front by both Damien Hirst and Bono.